Mrs Peel arrives at Steed's flat at 3:30am with a bottle of champagne - "I thought we'd have a party" but he explains he's waiting for Danvers who's couriering top secret papers from "you know where". "Hot stuff?" enquires Mrs Peel, to which Steed replies, "I've laid out my asbestos gloves". Danvers arrives, two hours late, and collapses, leaving a bloody handprint on the wall. 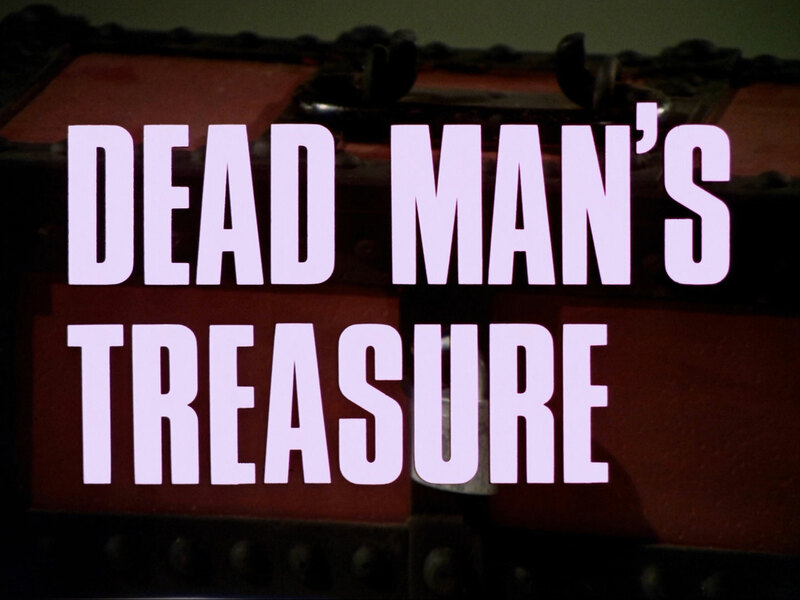 He explains he's hidden the papers in a red treasure chest, then dies. Outside, Alex (Edwin Richfield) instructs Carl (Neil McCarthy) to put a bug on the window, and they hears Steed and Emma discuss Danvers' route from the airfield. Emma gets out a map ("spread 'em out on the desk") and they discover even a direct route covers 35 miles of country roads. The postman delivers the first mail, which consists of a package from one of Steed's aunts ("Lead weights for your diving boots?" "Rock cakes from my Auntie Penelope") and the blood-stained envelope. Carl and Alex hear them discover the car rally invitation and find the key - "to a treasure chest?" - and observe that the prints on the envelope match the print on the wall. Emma reads out the address on the invitation and they set off on the 15 mile trip to Benstead's house, pursued by Carl and Alex. They're the first to arrive for the rally and Benstead's butler, Bates (Ivor Dean), frowns at their grubby invitation but ushers them in to see Sir George (Arthur Lowe), who is driving a formula car simulator. Steed bluffs their association and introduces Mrs Peel while looking at the simulator: "What a beauty!" "Oh, I do agree", says Sir George, ogling Emma. "Marvellous chassis", Steed notes and Benstead blusters, "Well, I wouldn't be quite so bold as that, but -" and Steed interrupts, "Her suspension's pretty complex too!" as Emma bends over the cowling. "Eh? ", says Sir George, "Oh! Oh, that! My patent simulator, all the controls geared to the film". Steed is given a ride of the simulator, Emma casually observing that Danvers would have enjoyed it, but Benstead doesn't react to the name. Steed makes a mistake on the course and receives a mild electric shock, which Benstead explains in intentional, to 'pep you up a bit'. They repair to 'the pits' for a drink - "non-alcoholic, of course" - and they discover someone has switched the 'standard' with the 'super'. Emma meanwhile has drifted off to search the house and interrupts Carl in the study, stealing an invitation with a stocking over his head. They fight but he escapes out the French windows. Carl and Alex, invitation in hand, enter the grounds and park alongside the other entrants and delight in the cover provided by the rally - they know Steed and Emma, but the Avengers don't know them - while Steed astonishes Benstead by asking him where the chest is. Outside, a late arriver is pistol whipped and his invitation stolen while Bates announces driving partners inside, drawing names from a helmet. Steed is partnered with Penelope Plain (Valerie Van Ost), a ditzy blonde with unfortunate fiancés. Steed decides to get out of racing, but a man approaches Emma, saying they've been partnered for the rally and introduces himself as Major Mike Colbourne (Norman Bowler). He declares he means to win the treasure, pricking up the Avengers ears, and Penny explains the car rally is combined with a treasure hunt, with clues scattered along the route and it's 1,000 guineas this year. Carl and Alex look concerned at the turn of events and Steed tries to get Benstead to hand over the chest to him before the race, offering to double the prize money. 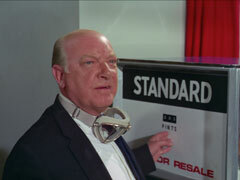 Benstead is suddenly killed by a surge of high voltage into the simulator. Steed rushes out to turn off the power, finding Bates at the switches. The butler protests his innocence, saying he found it at full voltage, "There could be a nasty accident". 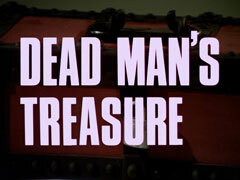 Steed tells there already has, Carl finding the body and leaving before they enter to see Benstead. Carl tells Alex there's a third party at work, and they try to guess who it is while Steed prods Bates into continuing as if nothing has happened. 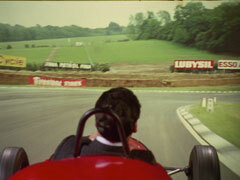 Bates starts the race, Les Mans style, and Carl and Alex trick their racing partners into being stranded, Miss Peabody (Penny Bird) crying, "But we haven't a clue!" while her companion (Peter J Elliott) looks on gormlessly. The cars take off along the B roads, Bates taking his Land Rover across the fields to keep up with the sports cars. Steed takes a glance at Penny's legs and turns off the road - "We'll take a short skirt .. short cut!" and she laughs. Mike and Emma, and Carl and Alex, have each taken shortcuts as well, and the three cars arrive at Mithering together. 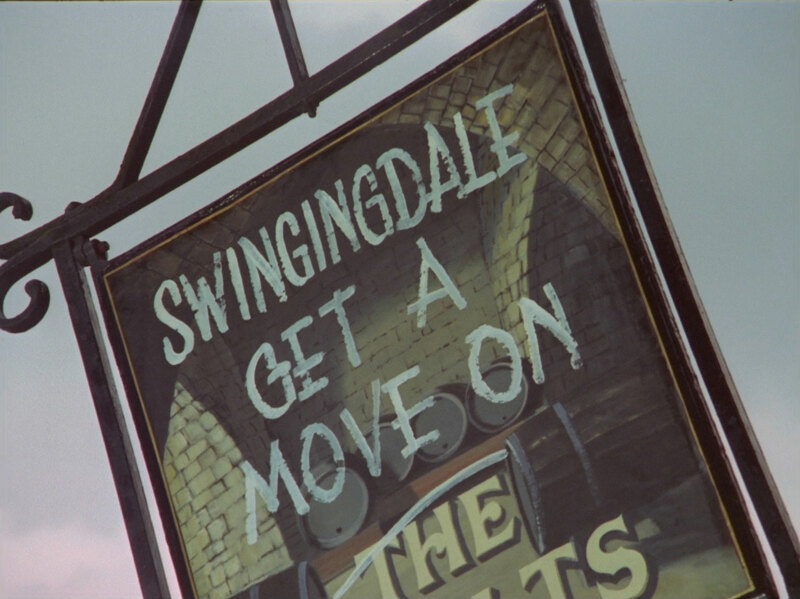 Mrs Peel finds a chalk message on the sign of the pub, "The Vaults" but before they can capitalise, Alex blocks their exit and the three of them set off together as the rest of the field arrive in the village. Clue 2: Swingingdale, get a move on! Carl and Alex are in the lead, and Alex plans to extend that by throwing caltrops out of the back of the car; Mike swerves to miss them, but ignores Emma's suggestion of stopping to remove them, Steed coming up behind skidding to a halt to miss them. The next car is not so lucky and crashes noisily into the hedgerow. Mike takes another shortcut and reaches a crossroads before Carl and Alex, and swivels the roadsign to point the wrong direction. Carl and Alex do the same thing, returning the sign to its proper orientation and heading off down the wrong road, leading to Steed taking the correct road. 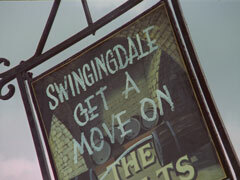 Mike and Emma arrive at Swingingdale ("not very swinging") and Emma spots a removals van, the clue painted on the inside of the rear ramp. The other two cars catch up just as she runs back to the car. The three set off together again and Carl and Alex find the clue on some sledge hammers. They lie in wait for Steed, even though Mike and Emma are ahead of them, but on the way in Penny notices caltrops in Carl's car and picks up a horseshoe; she enters the forge in time to stop Alex shooting Steed and hits Carl with the shoe. A fight breaks out and Carl and Alex escape but Penny happily tells Steed they won't get far as she put sugar in their petrol tank. Sure enough, a few minutes later they fly past the broken down Jaguar, Steed saying from now on it's plain sailing. "Penny Plain sailing", laughs Penny then Steed's	windscreen is shattered by a rifle bullet. Steed skids to a halt and Bates glares through some binoculars from a nearby hill... Mike meanwhile returns to his car on another hill and tells Emma the farm is just over the rise and there's no-one else in sight. They arrive there and split up to search for the clue, the barn being full of barrels. Bates arrives outside and loads his shotgun before entering the barn, but is knocked out from behind. Emma has meantime found the clue rolled up in the barrel of an old shotgun but spots Bates' boots and sends Mike off to check a 'barrel with writing on it' and checks Bates who comes to and tells her Mike is an impostor and must be stopped. Clue 5: BACK AT MY PLACE - WHAT A SHOCKING PLACE TO HIDE THE TREASURE! Mrs Peel drives off in Mike's car just before Steed and Penny arrive. They find Bates, who explains that Mike shot at them and Mrs Peel has gone back to the house, and they set off in pursuit. 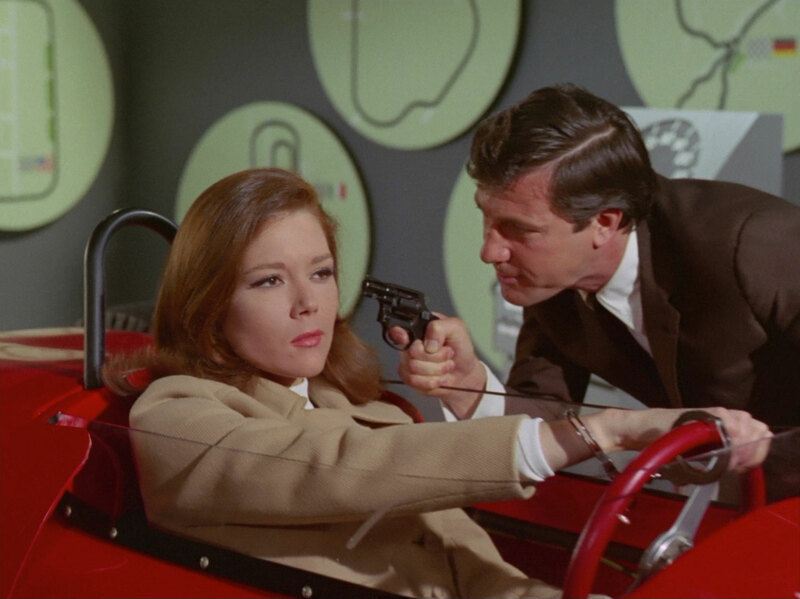 Mrs Peel is astonished when Mike springs from the boot of the car and holds her at gunpoint when they reach the house and he straps her to the simulator, increasing the speed and voltage to make her reveal the final clue. Carl and Alex, meanwhile, have got their car started again and try to run Steed off the road. 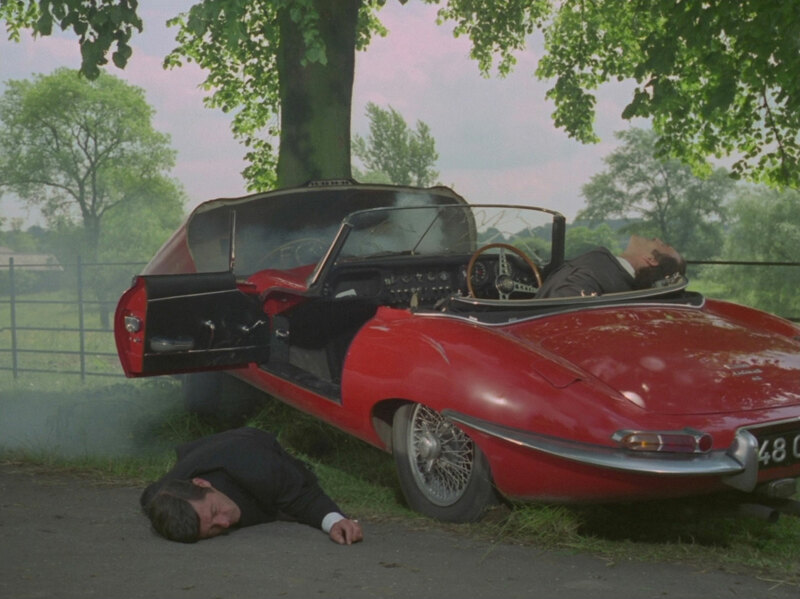 Penny hits at them with Steed's umbrella, causing Alex to shoot Carl and their car is wrapped around a tree. Mike has put the machine to full voltage and top speed by the time Steed and Penny arrive and Steed attacks him while Penny attempts to stop the simulator. She sets it in reverse by accident and Mrs Peel frantically tries to keep the car on the track by memory until Steed reappears, casually saying he disconnected the electrics, and disconnecting the steering wheel to turn the simulator off. He uncovers the chest in the engine compartment and opens it, Penny making off with the cash, leaving Steed to present Mrs Peel with a bottle of champagne and a kiss on the cheek. Mrs Peel arrives at Steed's flat where he is trying out his new electric razor - it sounds like a noisy racing car, it does "5,000 shaves to the gallon, a 1,000,000 whisker service once a year, fast down the straights, nippy on the curves, with four forward speeds and a reverse". Emma asks what the 'reverse' setting does and tries it out when Steed admits he doesn't know, and he returns to the room to find her sporting a bushy moustache.